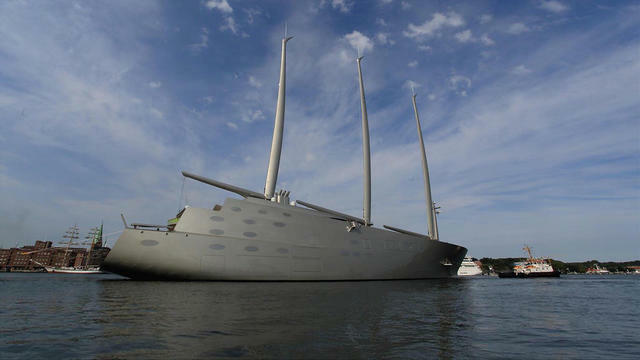 A spokesperson for Andrey Melnichenko, the owner of Sailing Yacht A, has laughed off media reports that the iconic 142 metre yacht is 'trapped' in the Baltic Sea, calling them "ridiculous and ill informed". Sailing Yacht A is due to be delivered in early 2017 and Boat International can now reveal the exact route that the sail-assisted motor yacht will take. Measuring 142.81 metres LOA, with an air draught of 100 metres and a 'light' draught of 7.5 metres, her delivery voyage will be a technical challenge, but one which the project team has thoroughly thought through. A spokesperson for the owner told Boat International: “Sailing Yacht A will travel through the Drogden strait where the maximum draught is 8.3 metres. Although she is designed to have a draught of 8 metres fully loaded, she sails in light loading conditions at 7.5 metres. ”Online speculation has suggested that Sailing Yacht A would struggle to pass under the Øresund Bridge, but project director Dirk Kloosterman said there was never any intention of taking this route, calling the idea “ridiculous, ill informed and actually quite laughable”. "Sailing Yacht A was specifically designed to have a light load draught of 7.5 meters for the very purpose of passing through the Drogden channel, as people will see for themselves in a few months time," he added.It has also been suggested that passing through the Drogden strait will cause problems with air traffic control at nearby Copenhagen Airport, however this is wide of the mark as well. All yachts with an air draught in excess of 40 metres must notify the airport 24 hours in advance of passing through the strait to reserve a slot, and once again half an hour beforehand, and of course Sailing Yacht A will be no exception. Built by the Nobiskrug yard in Kiel with exterior and interior design by Philippe Starck, Sailing Yacht A will break several records when she is delivered next year. Her carbon masts by Dykstra Naval Architects are the largest in the world and have been designed to withstand a Category 2 hurricane.